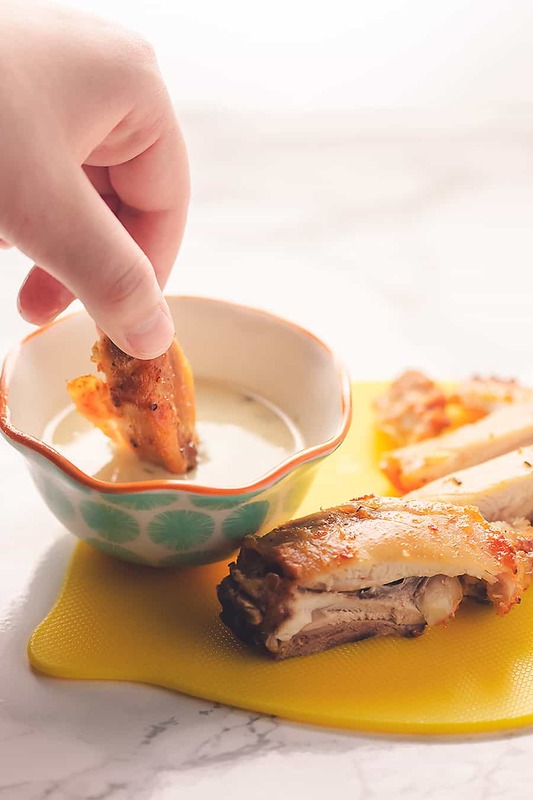 No Mess Crispy Chicken Thighs Recipe An easy baked chicken thighs recipe that uses a trick from Cooks Illustrated to get the chicken skin nice and crispy! Better than fried chicken! These Crispy Chicken Thighs are so easy to make and with no dirty skillet or grease splattered all over your kitchen! They are a frequent weeknight meal in my house because everyone loves baked chicken thighs and it is definitely kid friendly. They are the perfect low carb dinner…and so much easier than making keto or low carb fried chicken! I also like to buy frozen chicken thighs so I don’t have to cook them right away if I change my mind on what I want to make for dinner. Most grocery stores run sales often on fresh chicken thighs though, so watch out for that! The method I used to accomplish these crispy chicken thighs (and I mean super crispy!) is to shake them with baking powder and my seasonings in a bag before they are baked. This method makes the skin so crispy! I’ve cooked chicken thighs in cast iron, I’ve grilled them, and I’ve baked them in the oven with just salt and pepper, and they have never come out this crispy! When I pulled these crispy beauties out of the oven I was so excited! They are amazing dipped in ranch! Preheat the oven to 250F. Line a rimmed baking sheet with foil and spray a wire rack with cooking spray. 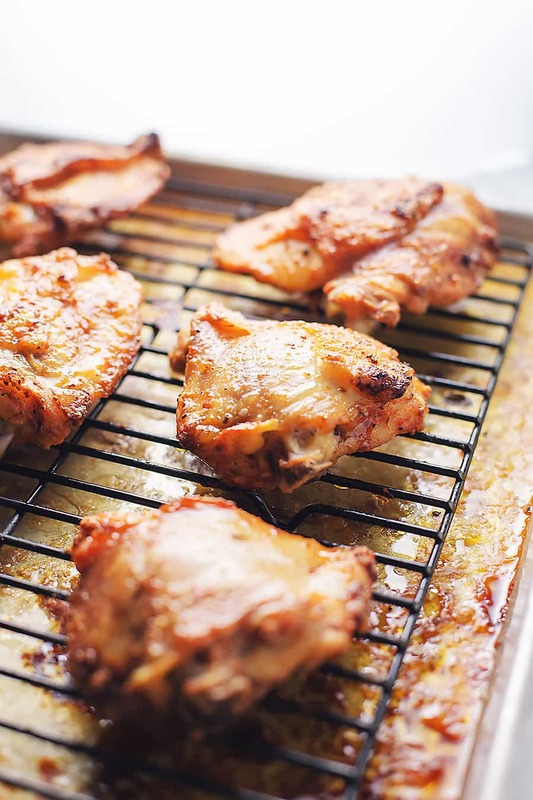 lay out the chicken thighs on the wire rack skin side up and place inside the baking sheet. Dry the chicken thoroughly with paper towels. Place the chicken in a bag or a bowl with a lid and toss the chicken in the baking powder and spices and then put the chicken back on the rack. Bake the chicken in the center of the oven for 30 minutes. Increase the heat of the oven to 425F and move the oven rack up one spot then bake for an additional 25-30 minutes or until brown and crispy. Chicken is cooked through when an internal temperature of 165F is reached. I also use this method to make my Garlic Parmesan Chicken Wings. If you want to be extra frugal, you can cut all of the chicken off of the bone and put the bones in the freezer. When you have a nice size bag full, make your own bone broth! To make these “no mess” you need to line your sheet pan with foil, then just throw the mess away! I figure the water and soap and scrubbing used to clean the nasty pan more than makes up for the cost of the foil. The only things left to clean up is the wire rack, but we spray it with cooking spray so it should clean right up! So much easier than frying chicken! I have used this same method to make super crispy skin chicken legs and they were amazing as well! These budget friendly crispy baked chicken thighs recipe is so easy to make and with no skillet or grease splattered all over your kitchen! Perfect low carb dinner and so much easier than making low carb and keto fried chicken! Serve with my Ultimate Creamy Bacony Cheesy Cauliflower! The baking powder is essential to making these chicken thighs extra crispy. I like to make sure it is distributed evenly by shaking the chicken with the baking powder and seasonings in a bag or a large bowl with a lid. I have made this recipe with frozen and fresh chicken thighs. The frozen chicken thighs are more wet before cooking than fresh but they yield the same crispy results. I have also used this recipe to make crispy chicken legs. They were just as amazing! Just make sure you keep an eye on them in the final cook because they can cook a little quicker than the thighs. Adding this to my repertoire!! Thanks!! What is the nutritional information? Carbs? Thank you for this fabulous recipe . I used it last night for bone in, skinless chicken thighs. I used 1 Tbsp of baking powder and they turned out great. So good in fact. I am using this recipe tonight using skin on bone in chiken breast. I am going to check the temp in the second stage of baking. This recipe is a keeper thank you Jennifer. Ah sounded good but did not work form! After 30 min at 250 chicken looked pretty raw. 30 minutes at 30 min uncooked and dried out. No mess In the kitchen, grease disaster in the oven. But DELICIOUS – so, worth it. I meal prep alot so always finding new and different ways to cook with chicken. Was a bit hesistant on how it was going to turn out. But it turned out amazing, juicy and crispy! So good and easy. I skipped the step of lining the pan with foil tho and nearly had a fire from all the grease in my gas stove! So don’t skip the foil ha ha and I may need to figure out what else to do so it doesn’t happen next time. Slightly reduced the baking powder due to the reviews and skin was perfectly flavored and crispy – thanks! Made this recipe last night and loved it! Super crispy skins! 🙂 Used slightly less baking powder since I had only 3.6 lbs. of meat to season, and I did wind up needing to cook the chicken in the oven at 425 degrees for an extra 16 minutes in order for it to cook fully through, but otherwise didn’t change a thing. Will definitely save and share this recipe. Thanks! YOU ARE A FREAKING GENIUS!!!! I have been searching for a skin-on chicken thigh recipe like this forever. Tried multiple other recipes, and the skin is still rubbery and soggy. Not this one. It cracked when I cut into it. The skin was perfectly crispy, the chicken was juicy, and the flavor was spot on. I can’t thank you enough for this recipe. We will be using this same technique for thighs, wings and drumsticks for the rest of my life. I made these with Cajun seasoning and dipped them in a mixture of 1/2 Franks and 1/2 butter. Yummmy. You have made my buffalo wing dreams come true. More meat! This recipe is amazing. I honestly didn’t think it was going to work as advertised, sorry for my cynical nature, but I was definitely proven very happily wrong. You definitely have talent Jennifer. Thank you very much for this wonderful site. Sooooooooo good. Did not taste any baking soda. My hubby said it was better than kfc 😂 and my toddler liked it. Thanks for the recipe! Now that’s a compliment! So glad you liked them! These were Amazing! The people complaining about tasting baking powder had to have used too much…I’ve put these in my weekly menu rotation. I don’t even like thighs but since I’m doing Keto these were the better choice. With this recipe I look forward to chicken thighs. Thanks for sharing! I cook my chicken like this all the time. I have been doing it long before I read this post but wanted to say that if you season well, you won’t taste the baking powder. Also, Morton’s Season All tastes just like Shake-n-Bake seasoning. Like, seriously. It’s also good on pan fried pork chops. Made this tonight and OmG it is so yummy!! Definitely a keeper! I made these tonight, the thighs looked beautiful. Mine tasted to much like baking powder, then I realized your only supposed to use 2 tbsp. Make sure you read the recipe all the way down to bottom. I didn’t see the full recipe until after I reread it. If cooking from frozen would you cook longer? You would definitely need to cook them longer. I’m not sure cooking from frozen would work as well though. This did not work at all. I followed the recipe exactly and all you could taste was the baking powder. My daughter had no idea how I made it and she actually asked me if there was some kind of powder on it. It wasn’t edible. There was a comment above that said they didn’t read the recipe and used it like it was flour, but it was supposed to only be 2 tablespoons… sounds like you did the same thing. I had the same issue…baking powder taste. I followed the recipe exactly, except for having slightly less chicken…but there was a bit of seasoning left in the bag. Theses thighs have become a staple in my home. We eat them at least once a week! Thank you for sharing! I’m prepping some freezer meals and I’m wondering if it would work to season the thighs and then freeze them, or of there would be too much moisture as they defrost? I have used frozen thighs to make this recipe with no problem. I’m not sure if anything would change with the added seasoning, though. I fixed this recipe and it was amazing — thank you so much for this!! My daughter really likes chicken breasts. Can you tell me if this recipe can be adapted to chicken breasts? If so, what time/temperature should I use and should I adjust the amount any of the seasonings? I just made these with boneless, skinless thighs, so it’s similar to breasts. I did them at 250 for 30 minutes just as instructed, then bumped them up to 400 (my oven runs hot) for another 15. They were a tad overdone ( internal temp 170). I suspect 12 minutes would’ve been enough. I finished them on high broil for one minute for crispiness. Delicious! Thank you so much for the recipe — cooked these last night and they were amazing!! My daughter is a fan of chicken breasts. Can you tell me if this recipe will work for chicken breasts and if so, what the cooking times/temperatures would be? Can I use skinless, boneless chicken breast? 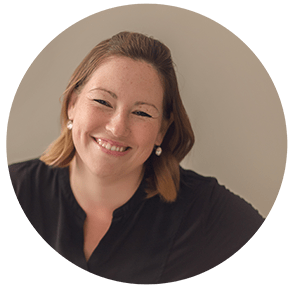 Hi Jennifer – this recipe was amazing with chicken thighs. If we use chicken breasts, what would the baking times be and would we need to increase the spices, etc for the larger pieces? I would only use bone in skin on chicken breast and I would double the spices but not the baking powder if you are doing 8 chicken breast. I would do the same time a temperature but make sure to check for doneness with a meat thermometer. Absolutely delicious!! Whole family declared it best chicken they’ve ever had! This will be a regular for us. Many thanks.